Guesthouses are cheap accommodations that omit services or amenities provided in hotels or ryokan and are basically in a self-service way. Shower room, toilet, kitchen, etc. 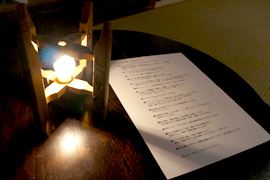 are shared among guests, and thus there are many chances to communicate with other guests. You may dine and drink in the common room and spend the time leisurely with other guests. The staff may go out between 11 and 16, so the entrance is locked. We may not be able to keep your luggage during this period. You can leave your luggage here between 8 and 11, and come get it between 16 and 21. Pay at check-in in cash (Japanese Yen). You'll get the key at check-in. This is a non-smoking guesthouse except in the designated area. Please use nearby coin parking lots. Shared kitchen with cookware, seasoning, a refrigerator, free coffee and tea, and Niigata rice. Shared toilet and shower room without time limit. Shower room with shampoo and body soap. We prepare one towel for free per person. For rent:Japanese bathrobe 400 yen (limited). For sale: toothbrush set 50 yen, earplugs for free. Supermarkets, convenient stores, Funaoka Onsen (a public bath) within walk distance. Please ask for details at reception. Guesthouse Itoya is an old wooden house located in a residential area. ※Itoya is in a residential area so when you go out or come back late at night, please avoid disturbing the neighbors or the sleeping guests. ※Some of the room partitions are Japanese sliding doors. ※Itoya is not soundproof and is not like hotels or ryokan with high privacy. ※Each room is equipped with a simple lock; please take care of your valuables. ※Please refrain from the admission of non-guest to the geuesthouse. ※There's no parking lot for bikes in Guesthouse Itoya, so please refrain from bringing bicycle or a motorbike here.